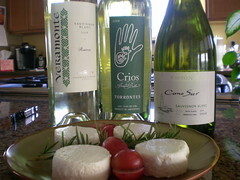 I love Sauv Blanc and a soft, fresh goat cheese. A duo of Chileans, the 2008 Veramonte and the 2007 Cono Sur, were great. I prefer the Veramonte; fresher vintage, and less green bean on the nose. 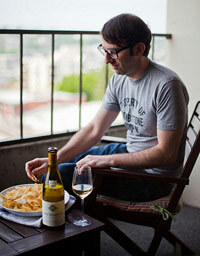 Chilean Sauv Blanc is the real-deal. I prefer it much more than New Zealand. Hello Jameson! I found this blog in foodista and followed it here. This is a lovely blog and interesting blog. By the way you can place more foodista widget in your past and future blogs so that other foodista readers can follow and see your blog too. Just search for a related recipe or food in Foodista and use its widget. I hope to read more from you. Cheers!